Weeks Seven and Eight of Hadar's Fit Out. 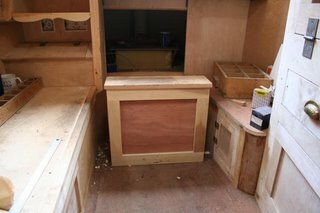 Hadars fit out is progressing at a great rate now and the boatsmans cabin is almost finished. 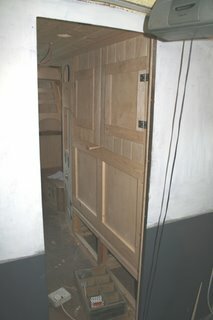 Roger made the double doors into the engine room. 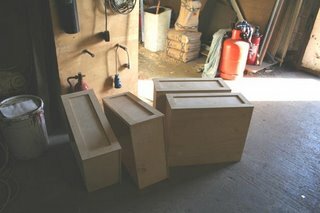 The four drawers which go underneath the bed cupboard and seating were made up ready for fitting. Roger then went onto make the wooden hatch slide, which was then covered in aluminium, and an aluminium strip screwed around the edge. 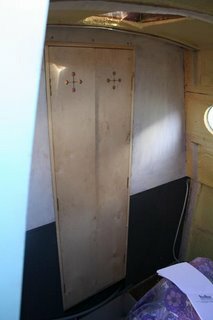 The final thing to be done was the lining and detail to the back doors of the cabin. We are so pleased with all the work done on the boatsmans cabin, it is just the way we imagined it would be. 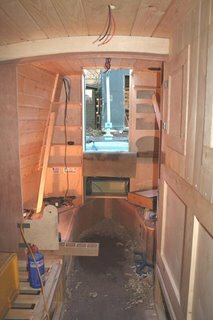 So with the boatsmans cabin fit out completed, it was time to start on the engine room. 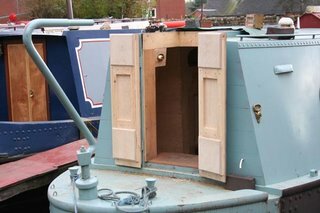 With the doors in place it was now time to line the engine room out. 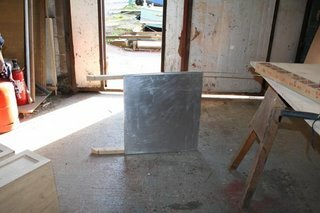 Firstly the ceiling was lined out with tongue and groove timber, holes were cut for the pigeon box, lighting and exhaust. Then the walls were lined out with plywood and edging strips for that final detail. The whole thing looks fabulous. 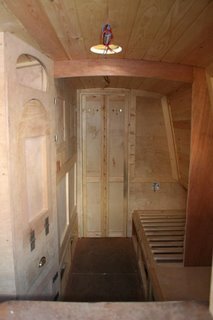 With the engine room almost complete, we will be sitting down next week, to discuss the fitout of the front cabin. 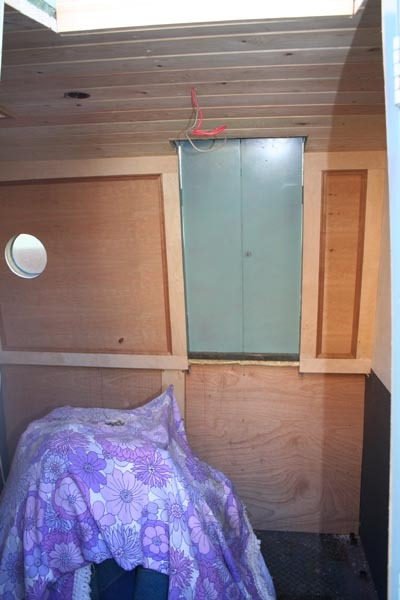 This will involve putting in the shower/toilet/laundry area, galley and saloon. 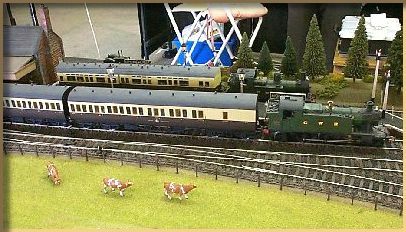 We are keeping it all very simple and tasteful, so keep popping in to see the changes happen. And no the cover over the engine is not my new curtain material LOL. I must apologise to all who have been waiting for the latest pictures of Hadar's fit out. Life at the boatyard has been pretty hectic this past few weeks, with other work being done at the yard. 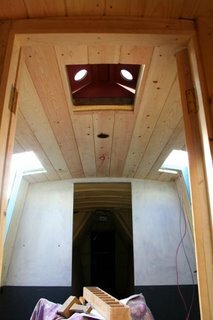 Hadar's fit out is coming along really well, and we are so pleased with the way her boatmans cabin is looking now. There are doors with hinges on all the cupboards . 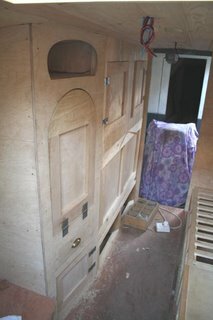 I just love the tongue and groove panelling on the cupboards. The table-cupboard door hinges down, and there is a handle on the crumb/cutlery drawer. The bed cupboard is now complete, and awaiting it's mattress. It is all very exciting. I know how daft we are, lol, getting excited about a bed cupboard, but it will be where we will sleep for the rest of our days, so bear with me if I get over excited at something so silly. Roger has been working really hard on the cabin. 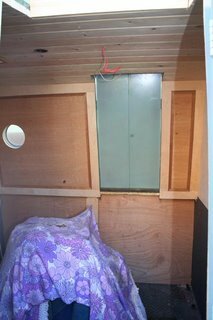 As you can see there are now shelves on both sides of the rear door, and he has also put in the partition between the bed area and living area. With a fake beam across the ceiling. We have a coal box, which sits under the top step and doubles up as a second step. We will be able to get loads of coal in that box. Under the shelves is the radio box, where boat people used to store their radio. I dare say we will find a good use for it. 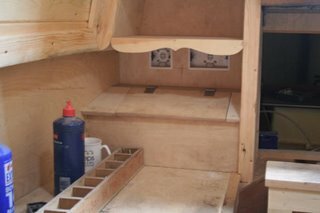 So as you can see it is all going incredibly well, the next stage is making and fitting the drawers under the bed.